The full flavour and creamy texture of Boursin cheese makes an ideal ingredient for party nibbles. All these ideas are quick and easy to prepare. With the exception of the Bruschetta, they can all be made in advance. Rye Bread Squares: Spread each side of the rye bread with a little Boursin. Cut each slice into eight small squares and top with your chosen topping. If using the tomato halves, garnish with chopped chives and a twist of black pepper. Bruschetta: Rub the garlic clove over the toasted bread slices then drizzle over a little olive oil. Spread each slice with 1tsp Boursin cheese, then cut the slices in half. Place a cherry tomato onto each piece of toast then garnish with a little fresh basil. As an alternative to the tomatoes top with pieces of Waitrose Italian mixed peppers, drained and thinly sliced, with a twist of black pepper. Serve within an hour of preparing. Tortilla Bites: Spread each tortilla liberally with Boursin cheese, then spread each with 5ml (1tsp) of pesto. Roll the tortillas tightly into cigars and slice into 7-8. 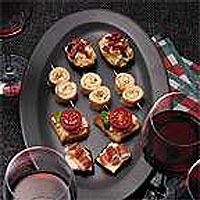 Serve on cocktail sticks, putting two rounds on each stick. Roasted Baby Potatoes with Boursin and Crispy Bacon: Place the potatoes in a roasting tin, drizzle over the olive oil and a little sea salt. Roast in a preheated oven 220°C, gas mark 7 for 35-40 minutes until tender. While they are cooking, dry fry the bacon until crisp, drain on kitchen paper. Split the cooked potatoes in half and cool a little. Spread each half liberally with Boursin and top with crispy bacon. Alternatively, blend the bacon with a 150g pack of Boursin. Serve the potato halves on cocktail sticks with the dip. Garnish with some freshly chopped chives.